Premium Patio Umbrella Cover / Fits most umbrellas to 8ft. 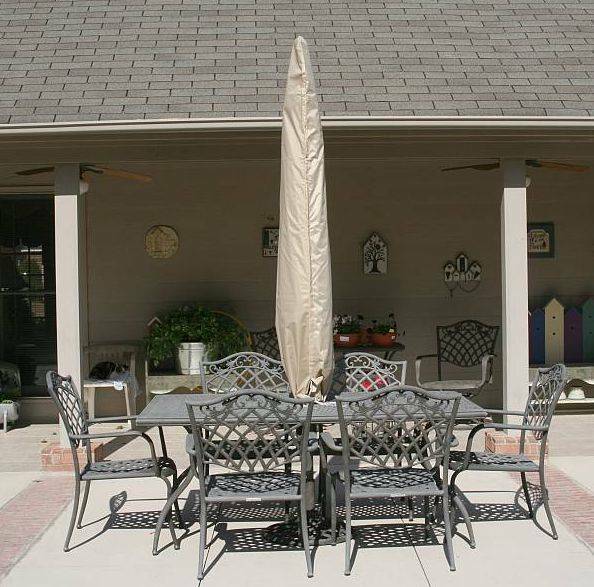 This Premium Protective Cover will fit most Patio and Market Umbrellas up to 8 feet. Tron-Weve Premier Protective Covers are made of a high-tech, waterproof material that is both lightweight and incomparably resilient. Tron-Weve fabric has been proven in laboratory tests to successfully resist temperatures as cold as -40 degrees F and temperatures up to 50 degrees hotter than the world's highest recorded temperature. In addition, thanks to a handy self storing pocket, each Tron-Weve Protective Cover is easy to store when not in use. Superior quality Tron-Weve Protective Covers initially cost a bit more than other patio furniture covers, but many consumers agree that paying more to get the best and longest lasting product is a practical choice. The Tron-Weve line offers all the same sizes and styles as the Shadow Grey Reinforced Cloth-Backed Vinyl Covers. Available in Beige only. Tron-Weve Protective Covers also feature a variety of unique features like elastic hems, drawstrings, zipper closures and Velcro closures. Click on the unique features link to view some of the features of these Premium outdoor patio and accessory covers.